Searching for the way to enhance your e-store daily monitoring process? Admin Email Notifier allows you getting email notifications of important events on your website. That’s really effective as you don’t have to constantly check Magento admin panel. Stay updated with everything happening in your store. Group event notifications in one email. Check out detailed and structured information. Get customizable email notifications right to your inbox. Select email template for each event. Enable/disable notifications to keep track of only relevant events. Make all configuration in one admin panel section. 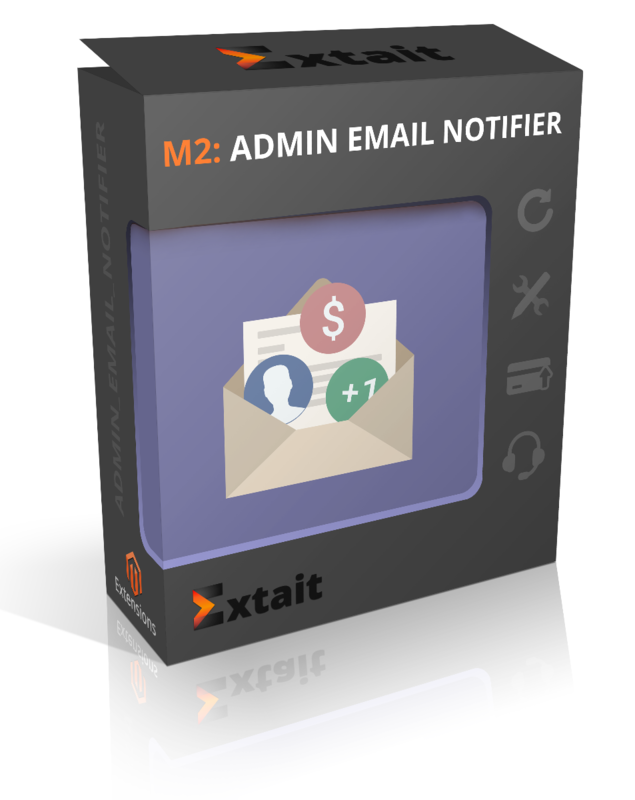 With Admin Email Notifier reaching full control of your store is a matter of few clicks. All you need is to select the types of events you’d like to be notified and everything which matters to you go straight to your inbox. You can view the information about essential events immediately: new orders, order status change, reviews, customer registration, newsletter subscription and unsubscription. As well, you will know whether a product is or will be soon out of stock and how good the sales are. Moreover, you can increase your security as you will get a notification if someone fails logging in as admin. With the module, you also be informed about some failures or crash on your e-store. You don’t have to run your Magento admin panel all the time to see new events. You ARE NOT missing anything important! In addition, for each type of event, you may choose a template and specify a separate email address. Thus if you have multiple admin users, you can be sure that only the right people in your team are alerted about the right event. Receive notifications of created new customer accounts. In such a way you don’t need to check how many new clients you gain, you see such info ready in your inbox. Follow the current state of your subscription rate. In case the number of unsubscribed customers increases, you can act quickly to find out what is wrong with your mailing strategy. Enabling this notification, you can track what products customers would like to purchase. If they delay buying, it will be easier for you to check out what discount offers to make in the shortest time. Learn about new purchases right after customers make the last click. Get to your email all necessary order details like ID, date, billing info, address, payment method, etc. Easily monitor how many coupons were applied. You can decide to generate new ones when you know that more customers need them. Has anyone left a comment? The extension immediately sends you a notification. It reduces your response time. In case there is any problem you can react quickly to solve it. Choose one or several order statuses (cancelled, closed, complete, payment review, pending, etc.) by using multiselect function. With this notification, you are always aware of how your store orders are been performing. This type of notification makes easier to monitor the sales of a particular product even if it can be placed in different orders. So you can see how your sales are boosting. Receive a notification about when someone failed to log in to your admin account for several times. The system blocks those users for some time, increasing security of your store. You don’t need to look into the error log files now. Enable this type of notification and you see the errors right in your inbox. Be informed whether your customers make payments successfully on your website. If something goes wrong you can notice it in the shortest possible time. Select the time period from the dropdown or specify custom value when to have grouped notifications. If there nothing have happened within the chosen time frame, you also get an email. For the most active events you can set the amount of notifications not to be disturbed by a bulk of emails. Like getting new 100 newsletter subscribers. All settings are made within a single window where you select the type of events you’d like to keep track of, specify a general email address or set different admin users for order management and store notifications. Specify one general email for all the events you want to get notifications. Or indicate multiple recipients for each type of notification to inform the right admin user from your team about something new in the store. Create and upload your own email templates for each notification type. If it’s needed, you can edit them anytime. All in all, you’ll always have extended information about each event on the store. Choose which types of notifications to receive. In general, you can monitor information about orders, customer activity, product sales and availability on stock, locked admin users and errors on the website. - Compatibility with Magento 2.3.0 was added. - A critical bug related to incorrect ID column type in module tables was fixed.